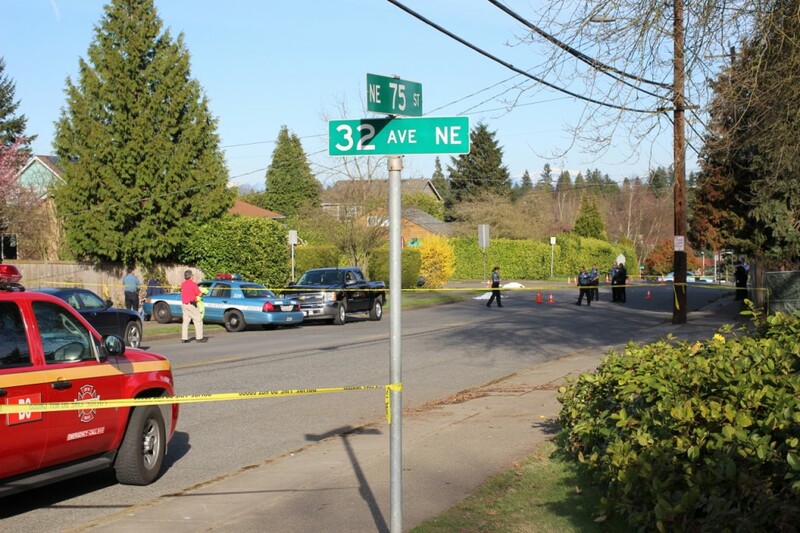 Shortly after 4 PM on Monday, March 25, four pedestrians were struck while crossing NE 75th Street at or near 33rd Avenue NE. Two died at the scene. An infant was given CPR and began breathing again a heartbeat was reestablished. And a 25-year-old female sustained a head injury. Both the infant and the female have been transported to Harborview Medical Center. A reporter speaks with an officer at the scene. 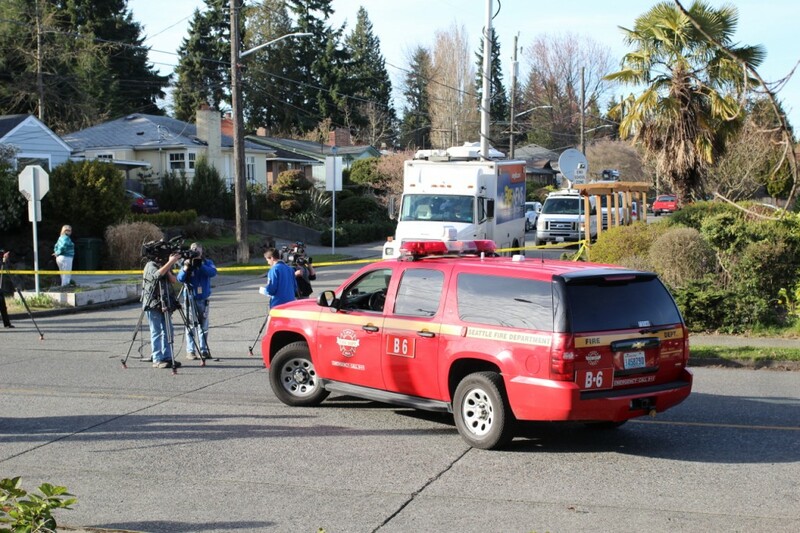 One of the 32 Seattle Fire Departments dispatched to the scene, along with one of many news vans. Seattle Fire Department Public Information Officer Kyle Moore making inquires about the pedestrians at Harborview. 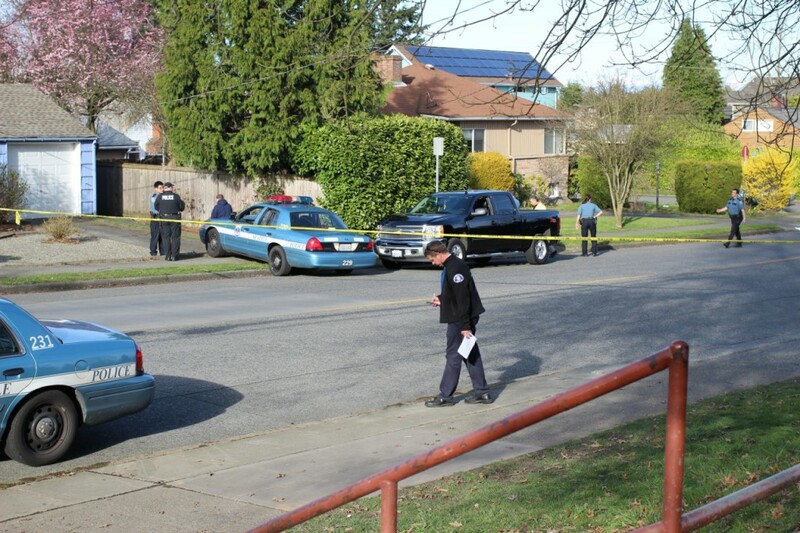 In the background, the driver and his vehicle is seen with officers. 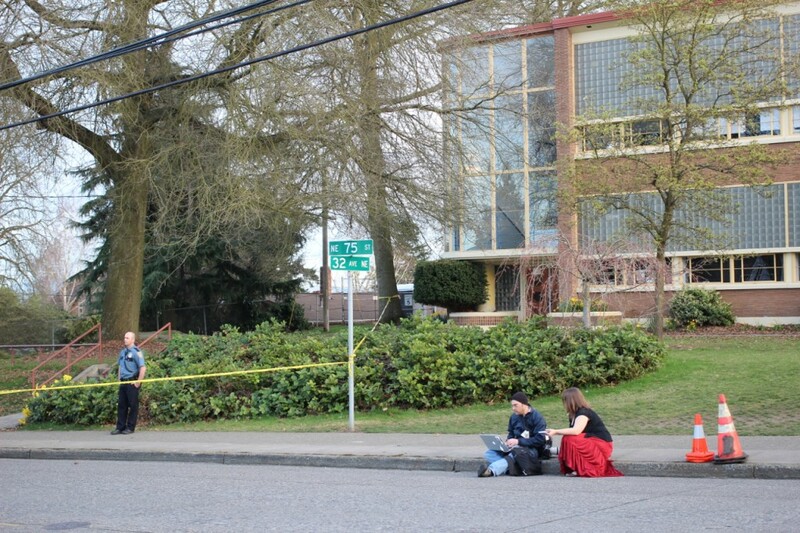 View of the full scene from the front lawn of Eckstein Middle School. 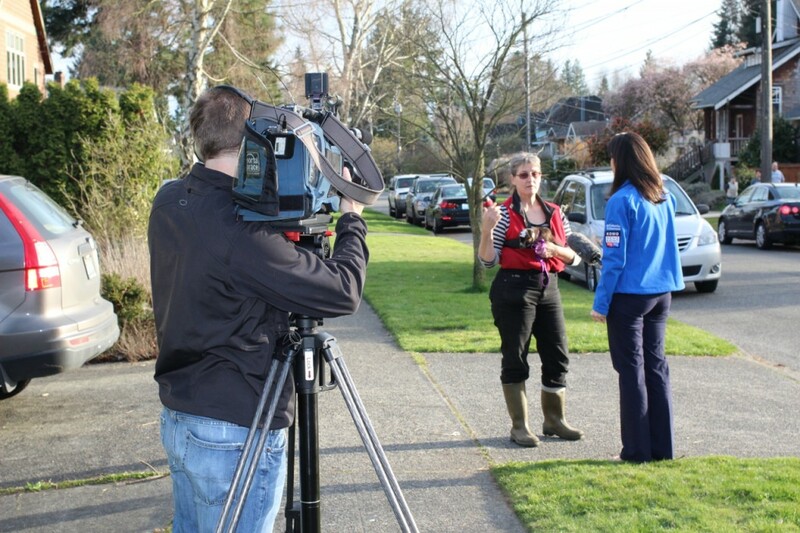 KOMO’s Kristen Drew interviews Lacia Bailey about her eyewitness account of the incident. View from 33rd Avenue NE looking north toward the intersection with NE 75th St. This was approximately Lacia’s view of the incident. No traffic on NE 75th Street. A later look at the scene from the west, large police vehicle mercifully blocking the view. 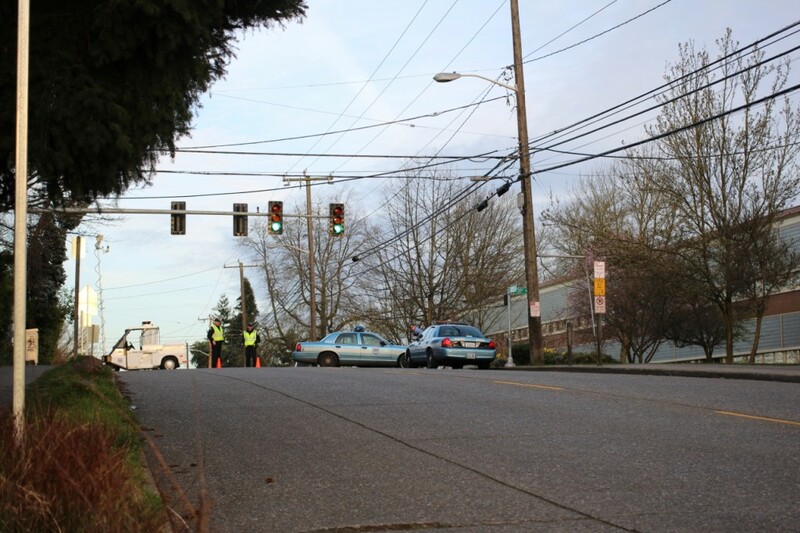 NE 75th Street blocked off at 31st Avenue NE. Eckstein Middle School to the right. 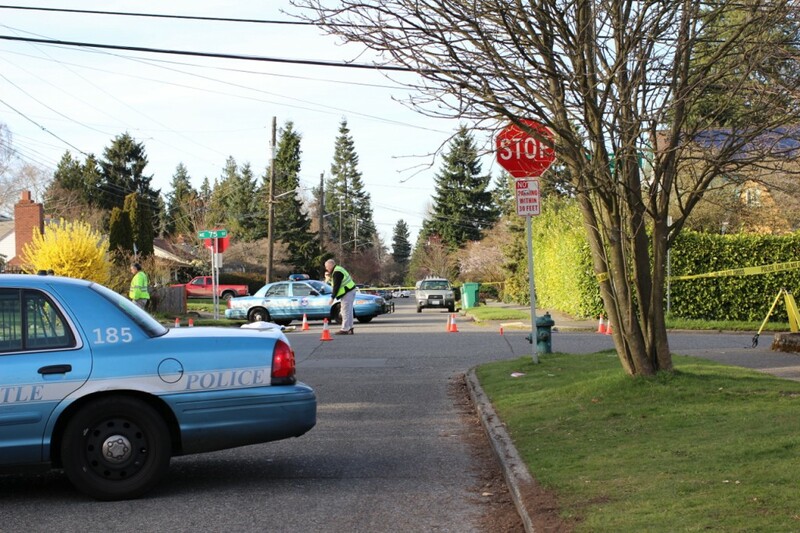 On the east side, 75th was blocked down at 35th Avenue NE. UPDATE (8:51 PM): At the scene we talked to Lacia Bailey, who had not only witnessed the incident and was one of the first on the scene, she had also talked to the pedestrians only moments before they were struck. The 25-year-old female was wearing her nearly-two-week-old infant and walking with her in-laws, the two of whom were new transplants to the area from Indiana. As the group was walking northbound on the east side of 33rd Avenue NE, they stopped to chat with Bailey who had been chatting with neighbors nearby. Bailey is well known in the neighborhood for her goat keeping, and had one of her newborn kids with her. She and the new mother compared babies before the group continued north on 33rd. Living on the corner of NE 75th Street and 33rd Avenue NE as she has since 1993, Bailey has seen her share of accidents on the busy northeast Seattle arterial. NE 75th Street, especially the segment near Eckstein Middle School, is well known in the area for its speeding vehicles, unmarked two-lanes-both-ways (officially two lanes westbound for morning commutes, the opposite in the evening), and poor line-of-sight due to its hilliness. Bailey ran toward the scene while calling 9-1-1. All four pedestrians were scattered across the NW part of the intersection (the infant had come out of the mother’s wrap and was also on the street). Other pedestrians in the immediate area arrived and started doing what they could for the injured, while Bailey got out her traffic accident cones and started directing traffic around the scene. She said that medically trained people who were stuck in the ensuing traffic also came to give aid. As Seattle Fire and Police reported earlier, two people (now known to be the parents of the infant’s father) died at the scene. The infant responded to CPR, and was taken to Harborview Medical Center along with the mother (who had sustained a serious head injury). 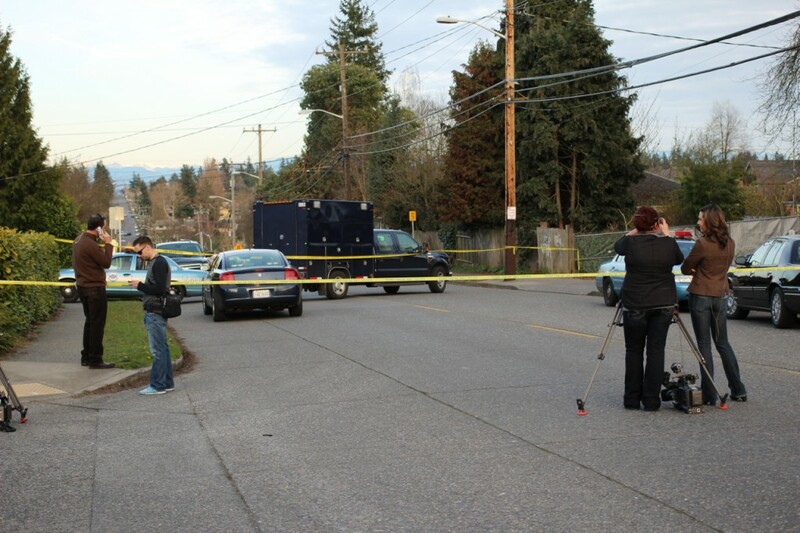 The busy arterial was closed between 31st and 35th Avenues NE by police as detectives processed the scene. The driver of the black Chevrolet Silverado truck that allegedly struck the family as they crossed NE 75th Street had pulled over, and at the time we were at the scene was being detained by police. He has since been booked into King County Jail for vehicular homicide. We do not know the current conditions of the mother and infant, but will update this post when we learn more. UPDATE (10:55 PM): Small update on the mother and infant, but in details only: The mother is 33-years-old, and the infant is 10-days-old. UPDATE (Tuesday, March 26): The pedestrians who died at the scene were a 66-year-old-man and a 68-year-old woman. 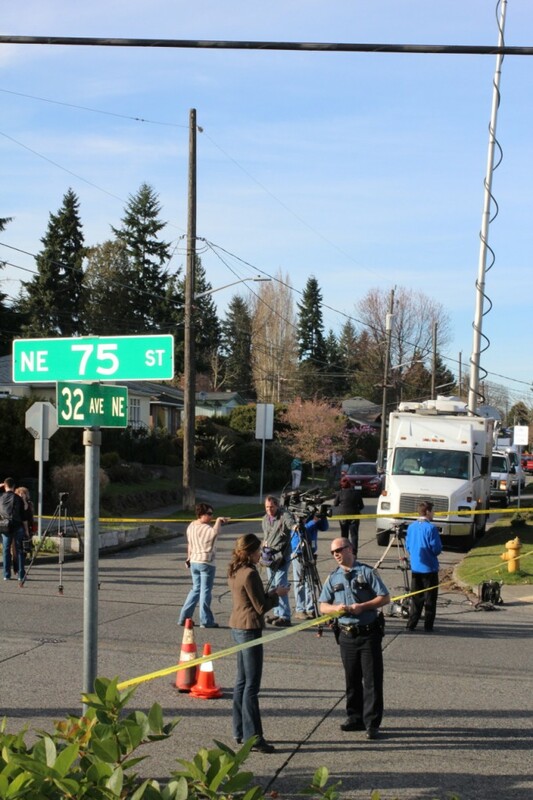 KING 5 Morning Reporter Teresa Yuan is at the scene this morning, where a memorial is growing. And police are actively pulling over speeders. UPDATE: The mother’s name is Karina Ulriksen-Schulte. Prosecutors at today’s bail hearing for the suspect said she has a crushed pelvis in addition to cranial bleeding. The baby is a boy, and his name is Elias. This from a story posted to WTHR’s website, an NBC affiliate station in Indiana. UPDATE (Thursday, March 28): A relative of the Schulte family has set up a journal at CaringBridge for Karina and Elias where medical updates are being posted. There is also an online guestbook there, where anyone can leave a message for the family. CaringBridge is a “health social network” that family and friends can turn to for keeping people informed on ongoing medical issues. So incredibly sad. Breaks my heart. There is a terrible problem with inattentive drivers speeding up and down 75th. What can we do as neighbors? Maybe this is the time to work together to ask for additional pedestrian safety along 75th, particularly since so many school kids traverse the areas. Crossing guards? Paint in the streets to delineate whether it is one or two lanes? Speed limit signs? Guard rails where the sidewalks are particularly narrow? What else can we do to make sure yesterday’s tragedy isn’t repeated? Both 65th and 75th are treated by freeways. 75th is especially dangerous because of the blind hill right next to Eckstein. Worse when there’s a blinding sunrise/sunset. I’ve worried something like this was going to happen, and openly expressed this every time we cross one of the main intersections off of 65th and 75th. Soluitons – I would like to see more police presence and speed control on both 65th and 75th, perhaps permanent radar speed signs which flash when folks are over the speed limit. Pedestrians need to be vigilant, careful, aware, use cross walks, and not take their time crossing dangerous intersections. Drivers need to slow down, and use their turn signals when turning left so they don’t block traffic behind and make people impatient. Everyone needs to be kind, patient, respectiful, and stay safe out there everyone! I agree with the suggestions above, but I do NOT understand how someone with a history of moving traffic violations (I think 5 by the Seattle PIs count) and TWO DUIs still had his driver’s license. I will add that the intersection of 35th Ave and 70th St (at Top Pot Donuts) is dangerous for pedestrians — I have had three near misses — each time, the driver was talking on their cellphone and turning. No turn signal and looking right through me. Drivers treat 75th Street like a freeway, and there are blind points all along the road – especially as one drives west toward the afternoon sun. With crossings only every 5 to 10 blocks, it’s no wonder people try to cross at regular corners, but with traffic speeding by, it’s completely unsafe. The city needs to recognize and address the use of arterials as “alternative freeways” and implement round-abouts, cross walks, and other tools to require drivers to slow down. Speed patrols tthat end in a few days are insufficient to address the real problem. This is awful. I have lived near 75th for over 60 years. it is a very dangerous street to drive or cross on foot. i thing the crosswalk at the junior high school should be a stop light. There should be a flashing crosswalk at 75th and 28th. The Wedgwood pool is 2 blocks away and all the users south of 75th cross at 28th to get there May to September. i hear the sound of accidents at that cor nor all summer long from my front yard. I fully agree with your point about the need for additional safety measures and how fast people drive along 75th. But I wanted to point out that the crosswalk at the junior high does have a traffic light. Streets need to be *engineered* for certain speeds, rather than relying on signs and occasional enforcement to stop speeders. Please let your politicians and neighbors know that you support safe streets in Seattle. There are many organizations working towards this goal, but there is constant pushback from people who prefer freeway-like arterials, or who fear changes that will potentially bring minor inconveniences. blog soon. Anyway, should you have any suggestions or techniques for new blog owners please share.